This meal is so easy it’s ridiculous. Like 15 minutes from start to finish. Avocado, spinach, garlic, lemon juice, salt and pepper. Whirl in food processor. Toss with pasta… Dinner is served. It’s good served warm. It’s good cold the next day. It’s so good that Mike is still talking about it, a week later. Who knew it would be so easy to impress that man? I ate mine on top of a huge bed of spinach. Mike had his with extra bacon on top 😉 Vegan or vegetarian? Skip the bacon and you’re good to go! Cook pasta according to package directions. Drain pasta and reserve 1 cup of pasta water. While pasta is cooking, make the sauce: heat a medium pan over medium heat and lightly spray with olive oil. Add in garlic and jalapeno and cook for 2 minutes, stirring frequently. Add in spinach and saute until wilted, about 2 minutes. Place spinach into the bowl of a food processor. Add in avocados and lemon juice. Puree until smooth. Salt and pepper to taste. 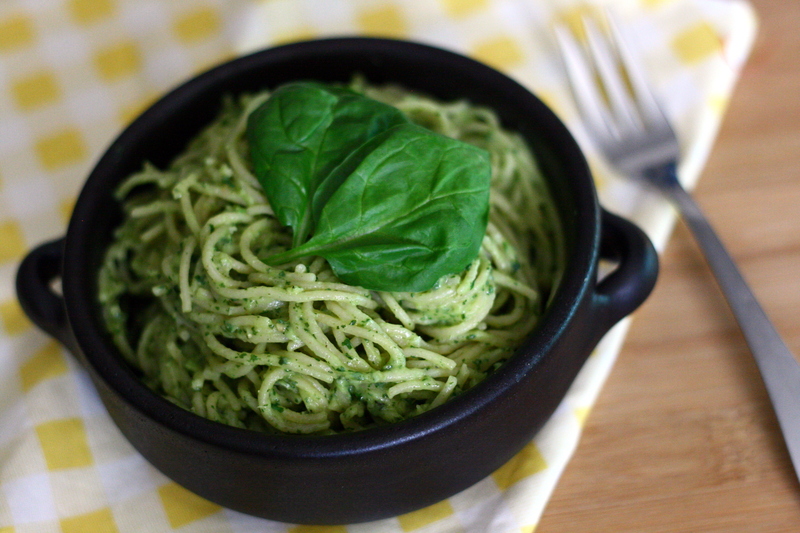 Mix the avocado sauce with cooked spaghetti and toss to coat. Add pasta water as needed to thin sauce to desired consistency. Top with bacon if desired. Categories: Dairy Free, Pasta, Quick & Easy, Special Diets, Vegetarian & Vegan | Permalink.